Are Bus Blind Spots Putting Pedestrians At Risk? Seattle is known for its conscientious pedestrians; locals famously wait for the pedestrian signal to cross, even in the middle of boisterous events like post-Super Bowl celebrations. What Seattle’s pedestrians may not know is that even if the light is telling them to walk, it may not actually be safe to cross. Unlike many other cities, Seattle does not have all-way pedestrian scrambles, also known as diagonal crossings, at most intersections. There is no period during the light cycle at most Seattle intersections when pedestrians, and only pedestrians, are supposed to pass through the crosswalk. Seattle’s drivers are always allowed to turn right through a crosswalk on green, and in most areas, they’re also allowed to turn right on red. Pedestrians are still supposed to have the right of way when a car is turning, but too many drivers fail to see pedestrians, misjudge their turns, or drive distracted. All too often, this combination of factors results in tragic pedestrian accidents. There’s another systemic danger to Seattle’s pedestrians, one that most traffic safety advocates aren’t talking about. King County Metro Transit owns a large number of buses manufactured by Orion, a now-defunct division of Daimler Buses. These models have an 8-inch-wide pillar on the front left-hand side that can obscure a driver’s view of the road to their front and left. A tall, wide rear-view mirror on the left further obstructs the driver’s view of the road to the left of them in this particular model. The lack of all-way pedestrian scrambles in the city combined with this large blind spot means that when a bus is turning left, the driver may not be able to see a pedestrian in a crosswalk, even when the pedestrian has the right of way and the walk sign is on. Seven out of eight collisions reported to the state Department of Transit involving a bus hitting a pedestrian as it turned left involved the Orion models with the large left-side blind spot. “Orions have epic-scale obstruction,” Brian Sherlock, an ATU International safety specialist, told reporters in 2015 after he test-drove one of the problematic models. “The entire street we were about to turn into disappeared from view as we entered the intersection.” Sherlock estimates that over 500 people have died nationwide as a result of bus driver visibility problems. Why Won't King County Fix The Dangerous The Blind Spot Metro Buses? 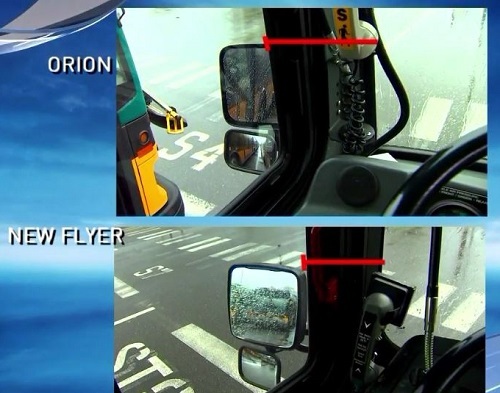 Although the Orion buses can be retrofitted to reduce the size of the blind spot, some bus drivers prefer the larger mirror, and King County had not announced any plans to retrofit the buses, besides mounting the problematic mirrors lower, as of the end of 2015. Injured pedestrians have also told reporters that Metro came back with a “low-ball offer” after they filed a claim for damages. Metro has proposed testing alarms that will flash on the driver's dashboard when a pedestrian approaches a bus's blind spot, but has not announced plans to retrofit the Orion buses. Structural changes to the bus fleet are cheap, easy, and already widely adopted in Europe at a cost of less than $300 per bus. It’s time for King County Metro Transit to take action.